New measures to control infections in humans and other animals are continuously being sought because of the increasing resistance of bacteria to antibiotics. In a wide tree screening survey of the antimicrobial activity of extracts of tree leaves (www.up.ac.za/phyto), Ochna pulchra, a small tree found widely in southern Africa, had good antibacterial activity. We therefore investigated the antibacterial activity of acetone leaf extracts of some other available Ochna spp. Antibacterial activity and the number of antibacterial compounds in acetone leaf extracts of Ochna natalitia, Ochna pretoriensis, O. pulchra, Ochna gamostigmata and Ochna serullata were determined with a tetrazolium violet serial microplate dilution assay and bioautography against Staphylococcus aureus, Escherichia coli, Enterococcus faecalis and Pseudomonas aeruginosa, bacteria commonly associated with nosocomial infections. The percentage yields of the extracts varied from 2.5% to 8%. The minimum inhibitory concentrations of the five species ranged from 40 µg/mL to 1250 µg/mL. E. coli was sensitive to all the extracts. 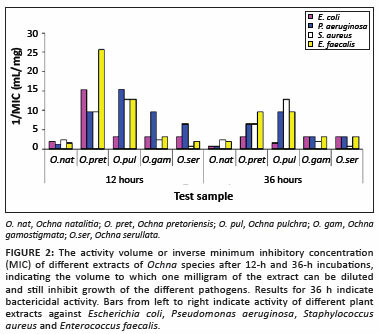 The O. pretoriensis extract was the most active with minimum inhibitory concentrations of 0.065 mg/mL and 0.039 mg/mL against E. coli and E. faecalis, respectively. The O. pretoriensis extract also had the highest total activities of 923 mL/g and 1538 mL/g, indicating that the acetone extract from 1 g of dried plant material could be diluted to 923 mL or 1538 mL and would still kill these bacteria. Based on the bioautography results, the two most active species, O. pretoriensis and O. pulchra, contained at least 10 antibacterial compounds with similar Rf values. Some of these antibacterial compounds were polar and others were non-polar. Variation in the chemical composition of the species may have some taxonomic value. The order of activity of the species to the bacteria were O. pretoriensis > O. pulchra > O. gamostigmata > O. serullata > O. natalitia. Even before toxicity and bioavailability issues are considered, some Ochna spp. leaf extracts have the potential to be used in treating skin infections. In a study by Reutrakul et al.9, Ochna integerrima extracts had good antiviral and antiparasitic activities. The study involved the isolation of biflavonoids with antimalarial activity; a flavonoid glycoside with anti HIV-1 activity was also isolated from the same species.9 An infusion of the roots and leaves of O. integerrima is used locally as an antidysenteric and antipyretic preparation.10 There appears to be no previous report on the antibacterial activity of any of the 86 species of Ochna to date. We have found that plants used traditionally to treat infections have very low antibacterial activity in in vitro assays. The low activity exhibited may be related to the extractant available to traditional healers because aqueous extracts of plants have very low activity.11,12 Consequently, we started investigating the antimicrobial activity of acetone leaf extracts of more than 600 South African trees. We used only acetone for extraction because it is the best extractant for antimicrobial compounds from plants, based on parameters such as efficacy of extraction, diversity of compounds extracted, ease of removal of solvent after extraction, human safety and safety to microorganism in bioassays.11 In these studies, Ochna pretoriensis had good antibacterial activity (Pauw and Eloff, unpublished results). The good activity of O. pretoriensis motivated the present investigation of the antibacterial activity and the number of antibacterial compounds present in other, easily available Ochna species: Ochna natalitia, O. pretoriensis, O. pulchra, Ochna gamostigmata and Ochna serullata. Leaves of the five plant species investigated were collected in summer at the National Botanical Gardens in Pretoria, the Lowveld National Botanical Gardens in Nelspruit and the University of Pretoria Botanical Gardens. The origin of each tree is documented in the database of the botanical garden and voucher specimens were deposited in different herbaria (Table 1). Only clean dry leaves without any lesions or dirt were selected. Leaves were not washed with water to limit the possibility of extracting some water-soluble compounds and especially to limit the possibility of fungal growth on moist leaves. The leaves were dried in the dark at room temperature and pulverised into a fine powder (with particles less than 1 mm in diameter) and stored in closed glass bottles in the dark until use. The dry leaf powder (2.0 g) was extracted with 20 mL acetone (technical quality; Merck Pharmaceuticals, Pretoria, South Africa), which is very effective in extracting antimicrobial compounds from plants.11 The resulting suspension was shaken vigorously in 50-mL polyester centrifuge tubes and centrifuged for 15 min at 4000 rpm (Hettich Centrifuge, Rotofix 32A, Labotec, Johannesburg, South Africa). The extracts were decanted into preweighed glass vials through Whatman No. 1 filter papers and concentrated to dryness under a stream of cold air. The dried extracts were made up to a concentration of 10 mg/mL (stock solution) in acetone to be used in subsequent assays and stored at 5 ºC in tightly stoppered glass tubes. After development, the plates were visualised under UV light and sprayed with vanillin-sulphuric acid reagent spray (0.1 g vanillin in 28 mL methanol and 1 mL sulphuric acid) and heated at 110 ºC until optimum colour development was achieved. 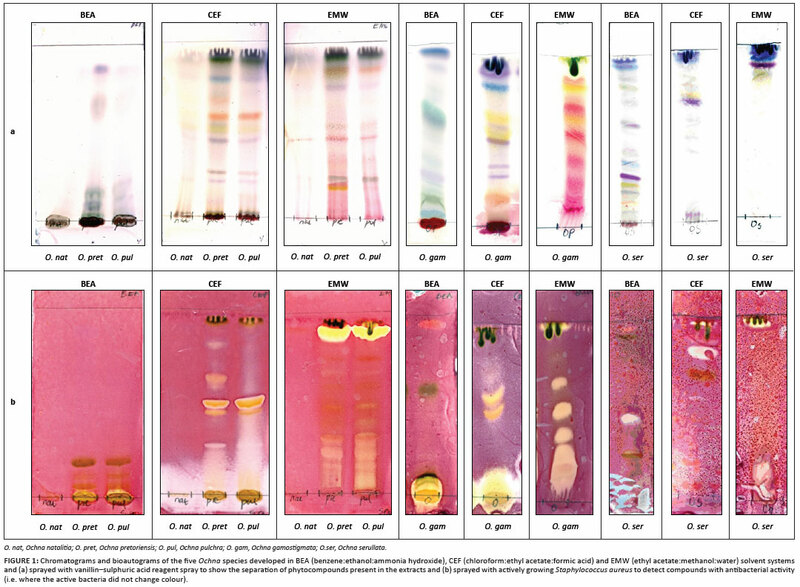 There were similarities between the TLC chromatograms of O. pretoriensis and O. pulchra extracts; each had 10 similar bands, which is indicative of similar chemical compositions. The chromatograms may be useful in the taxonomy of the plants examined.19 Some of the spots were yellow when viewed in daylight and light blue when viewed under UV light (365 nm). This difference may be as a result of the presence of a strong chromophoric group which is often observed with plant phenolics (especially flavonoids and their glycosides). Whilst there were some major differences in the TLC fingerprints of the five species, there were also identical bands in similar mobile phases with the same Rf values across a number of species, because of similar biogenetic pathways and metabolite pool sizes in the genus. The MIC values of the plant extracts ranged from 0.039 mg/mL to 1.25 mg/mL after a 12-h incubation and from 0.078 mg/mL to 1.25 mg/mL after the 36-h incubation (Table 2A). O. pretoriensis was the most active against E. coli and E. faecalis with MIC values of 0.065 mg/mL and 0.039 mg/mL, respectively. O. pulchra was the most active against P. aeruginosa and S. aureus with MIC values of 0.065 mg/mL and 0.078 mg/mL, respectively. E. coli was sensitive to all the extracts. The order of activity of the species to the tested organisms was O. pretoriensis > O. pulchra > O. gamostigmata > O. serullata > O. natalitia. Different patterns of sensitivity of the test organisms to the plant extracts were noted after 12 h and 36 h (Table 2), which indicates that some of the bioactive compounds in the extracts are bacteriostatic and some are bactericidal. The MIC of O. gamostigmata was 0.31 mg/mL at 12 h against both E. coli and E. faecalis; the MIC remained the same after 36 h, indicating that the bioactive compounds had bactericidal activity. In contrast, the MIC of O. pulchra against P. aeruginosa was 0.063 mg/mL after 12 h, but rose to 0.1 mg/mL at 36 h, which indicates that the activity may be partly bacteriostatic. O. pretoriensis, O. pulchra and O. gamostigmata had high activity with the total activity of O. pretoriensis being 1538 mL/g (against E. faecalis), O. pulchra 1153 mL/g (against P. aeruginosa) and O. gamostigmata 769 mL/g (against P. aeruginosa). Three of the five Ochna species investigated - O. pretoriensis, O. gamostigmata and O. pulchra - had significant antibacterial activity based on their MIC values and bioautography. The bioactive compounds in two of the most active species, O. pretoriensis and O. pulchra, were similar. O. pretoriensis had the highest total activity of 1538 mL/g against E. faecalis and 923 mL/g against E. coli. Publications on other species in the Ochna genus have reported the isolation of flavonoids and biflavonoids with antimalarial and anti-HIV activities. We report for the first time, the antibacterial activities, the number of antibacterial compounds present and the Rf values of antibacterial compounds of some Ochna species. Because of their high total activity it appears that acetone leaf extracts of several Ochna species could be valuable in treating infections caused by these nosocomial pathogens. O. pulchra is notoriously difficult to cultivate and would not be a good candidate for the development of a herbal medicine. O. pretoriensis is easier to cultivate and therefore is a better candidate for an in-depth investigation. We also have isolated and characterised several of the compounds responsible for the antibacterial activity of O. pretoriensis; these results will be published elsewhere. The National Research Foundation of South Africa and the University of Pretoria provided financial support. The curators of the Pretoria National Botanical Gardens, the Lowveld National Botanical Gardens in Nelspruit and the Kirstenbosch National Botanical Garden allowed us to collect plant material. We declare that we have no financial or personal relationships or competing interests which may have inappropriately influenced us in writing this article. T.J.M. performed the research and wrote the first draft of the manuscript. J.N.E. identified the project, guided the research, and revised and submitted the manuscript.